1944 - Stunning vintage one sheet (27x41") from this Universal horror classic "The Frozen Ghost" staring Lon Chaney Jr, just a few years after making his most famous role, "The Wolf Man". This beauty has been professionally linen back and displays striking vintage artwork. 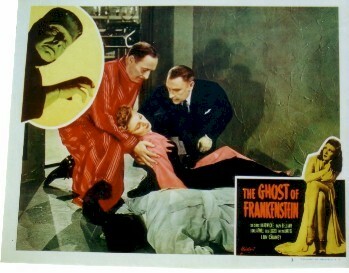 1943 - Original vintage lobby card from the Universal Horror classic "Son of Dracula". This has been beautifully framed and matted in an incredibly attractive display. Ready to impress in the home or office. About 20x20" overall size. 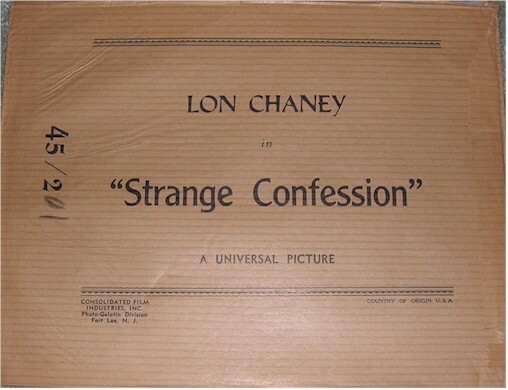 1935 - This is absolutely, not only the earliest, but most incredible item I have ever seen from Lon Chaney Jr.!!! 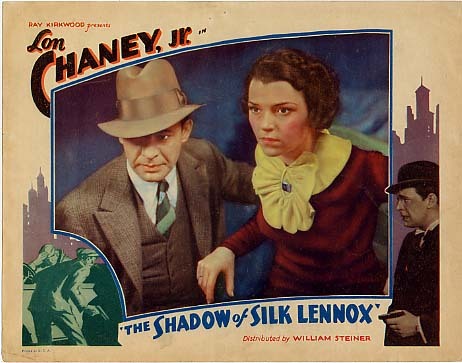 AN original lobby card from the 1935 Chaney classic "The Shadow of Silk Lennox". 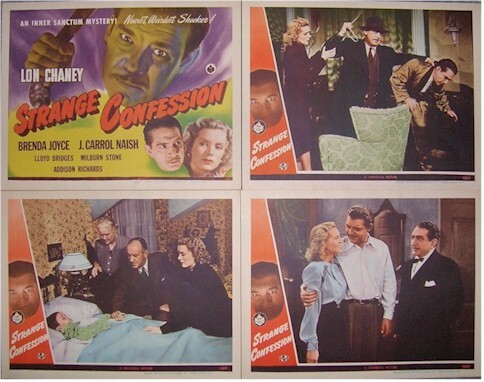 The colors, and artwork from this 1935 movie, "The Shadow of Silk Lennox", is awesome, far more impressive then some of his more memorable roles, i.e., Wolfman, etc. A real beauty and one of a kind!!!! 1943 - Lon Chaney Jr., Richard Dix Original Lobby Card "Eyes of the Underworld" 1943 movie, directed by Roy William Neill. A great scene with Chaney. 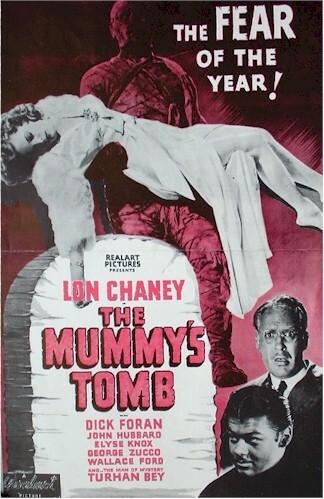 Starring Lon Chaney Jr. as "The Mummy"
Great scene with cast looking into the coffin of Mummy. Not a re-release but the ORIGINAL 1944 release. 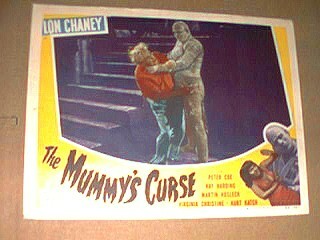 Incredible border art of Chaney as the Mummy!! 1949 - Realart re-release for this horror classic. A very large , about 12x16 pressbook, 4 pages, with spectacular graphics! Inside has photos of all the posters and lobby cards available to theatre owners for promotion of the film. First one we have ever seen. 1949 - the Realart re-release. A great lobby card with incredible border art and graphics. Excellent condition. Look at the very unique Frankenstein insert on the border!! Very RARE!! 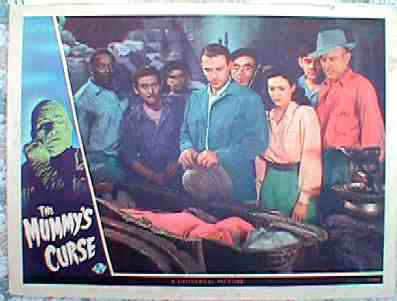 1945 - UNIVERSAL HORROR Picture starring Lon Chaney Jr. 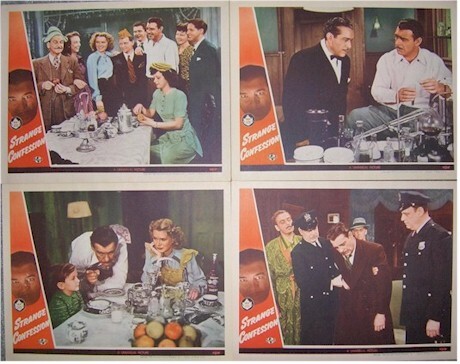 COMPLETE Original Vintage Lobby Card set. Also, comes with the Original Universal Lobby Card Package Envelop - VERY RARE as these RARELY ever survive. This is the FIRST we have ever seen! The artwork and graphics are stunning and the fact that this 60+ year old lobby card set was never used is EXTREMELY RARE to find! RARE Vintage Authentic autograph with unusual inscription, date and location signed. (also have the Bela Lugosi autograph from this same collection and location acquired. See the Bela Lugosi page from our autographs link above).